In this article, we’ll explain the drone laws in Zimbabwe. After getting the approval from the CAAZ, you will also need to obtain a Temporary Import Permit (TIP) from the Zimbabwe Revenue Authority. These rules apply to foreigners. But the citizens of Zimbabwe have to overcome some hurdles before they can rise with a copter. Locals always need a Letter of Approval (RPA) from the CAAZ in Zimbabwe before you want to get on a drone. RPAs are initially valid for one year and can then be issued for a further three years. Above all, for the application, you must demonstrate your piloting skills and show that your aircraft has sufficient safety standards. For commercially available drones, I assume that a Letter of Conformity (i.d.R is part of the delivery) is sufficient. The application will incur a fee. Once you’ve mastered the bureaucracy, keep in mind that during Copter flights, a first-aid kit and a fire extinguisher must always be within the range of the helper. Maximum altitude: In Zimbabwe, multicopters are allowed to ascend up to a height of 120 meters (400 feet). Maximum horizontal distance and FPV: In most cases, a horizontal distance of 500 meters between drone and you is required as a controller. If you are eligible for extended visual line-of-sight maneuvers, you may fly up to 1,000 meters if a qualified observer observes the drone. 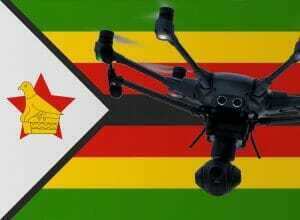 Compulsory insurance: In Zimbabwe insurance for multicopters is mandatory. Distance to airports: To airports, a distance of 5 kilometers (3 miles) must be observed. Hours of Operation: Drone flights at night require approval from the CAAZ. Special legislation: Each drone must have an altimeter (altimeter), so you can always understand the current altitude on the ground. If your drone does not have this feature, you must abide by the toy drone rules (see below). Requirements for commercial pilots: I understand that Zimbabwe does not distinguish between drone flights for recreational and commercial purposes. Good to know: These laws do not apply to toy drones for children unless they are equipped with surveillance equipment (such as a camera). In these cases, you can fly as high as the highest obstacle in an environment of 300 meters. The maximum horizontal distance between the controller and copter is also 500 meters, and you must always have direct eye contact (Restricted Visual Line-of-Sight). We have researched the listed drone regulations for Zimbabwe to the best of our knowledge. We cannot guarantee the correctness of the information. If you want to be on the safe side, contact the competent aviation authority. Alternatively, you can also ask the embassy in your country for further information about the regulations. Please leave us a comment when you receive news and/or gain experience with your copter in Zimbabwe! Thanks for your useful information. I am a Mavic Pro user from the UK and hope to use it in Zambia later this year. I would value your advice re local rules etc. You’re welcome! Unfortunately, I was not in Zambia myself. if i was to go to Zimbabwe without a drone licence or an import thingy, but the drone is for personal use, and also for Botswana? will it be confiscated? what would happen if i cant show proper papers? but its only a (gopro karma) personal drone?? On the other hand, no reader has reported problems with entry. I’m thinking of giving a drone to my friends in Zim as a Christmas gift. I’m planning to bring it with me this December when I travel there. Will there be any issues with me bringing it in as a gift? thanks a lot for all your valuable articles! I am going to travel to Zimbabwe and Botswana (and Johannesburg for the return flight) in September and was hoping to take my Mavic Air with me. But I am slightly confused with the regulations. I applied to the CAAZ via Email 31 days in advance of the date I will enter Zimbabwe but from the name this process is just to obtain the permission for the temporary import of an RPA – there is nowhere mentioned that you are then allowed to fly it (within restrictions of course). Also I am not sure how the process for obtaining the TIP from the Revenue Authority would look like. On top of that the statement from the CAAZ you posted as reply to an earlier comment – “The drone regulations permit Zimbabwean citizens only to register and operate drones in Zimbabwe.” – confuses me even more. May I ask you to clarify if at all – and if so under which conditions – a foreigner is allowed to bring, and ideally also fly, a drone in Zimbabwe? I apologize for my late answer. How was it going for you? thank you for your reply, even though it came after my trip, it would not have changed anything. After some further research I found some information from a local that rules are pretty tight but they are not enforced up to the point where you would not even get a reply to your requests – and in fact this turned out exactly the same for me. No answer at all from any of the offices, neither Zimbabwe nor Botswana. In the end I did bring my Mavic Air with me (in hand luggage as you always should) and nobody did even ask one thing or wanted to see it at any point. When we were there we stayed in rather small safari Camps, mostly in Private Concession (so outside of the National Park prohibitation) and even though the scenery would have definitely made for some nice shots I ended up not using it at all because I did not want to disturb other safari guests and/or camp staff and also did not want to force anybody (mainly camp manager) into the situation of being afraid to either upset me by forbidding it or upset other guests by allowing it. Hope this may be helpful for other travellers! Thank you for your explanations! I hope you had a wonderful trip, anyway! On my last 2 visits to Zimbabwe I have shown my drone (DJI P4) at the airport. I have flown it in the City and rural areas. Never have I encountered any issues from local authorities. Do not fly near crowded areas – unnecessary attention. Near Airports is a NO, NO!!! National parks with animals is a NO!! Good to know. Thank you for sharing your experience! I am currently in Zimbabwe and i have a phantom 4. I showde the drone at immigration and ond lady wanted me to see a superior officier. I had a mail from the Zimbabwe aircontrole, that Saïd that there are currently no rules and that flying a drone could not happen. I told here i would not use it in Zimbabwe , but in Botswana. She let us go without further dicussion. I asked the lodge manager if i could fly the drone around the lodge and they Saïd iT was ok. No problem at all. The lodge was only 500 m away from the Victoria Falls. I waited untill all helicopter flights were over (after 16 o clock) and flew the drone several times over the Falls even up to 1000 meters away. Nice shots … no problem.